WHITHER GOLD by Anthony Humpage, Rich Dad Education | American Precious Metals, Inc. CAUTION DISCLAIMER: Nothing in this commentary is investment advice. If I knew with certainty what any financial market was going to do tomorrow, next week or next year, I would no doubt be sitting in some idyllic spot, enjoying a drink with fruit and a small umbrella in it. Sadly, I don’t, and I’m not. I will tell you that I own no position in any of the instruments discussed here, and as I write in Sept 22nd 2013, I have no plans to take one. I do have a long position in physical gold and silver and may or may not add to that position in coming weeks. With apologies to my international readers, this is written from a US perspective. The future price of gold has been the subject of some debate lately, driven in large part by the yellow metal’s price plunge from its recent highs. Using the widely-owned gold ETF ticker GLD as a guide, gold has fallen over 30% since its peak in late 2011. The same ETF has fallen 21% this year alone. GLD is “paper” gold, but, it is asserted that it is physically backed by real gold. 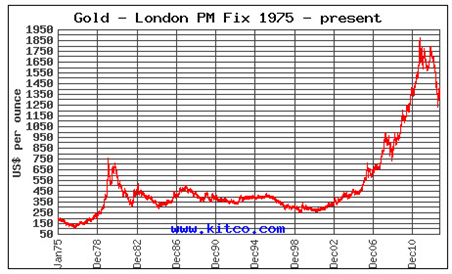 The price of gold bullion has fallen by similar amounts. If you own gold, what your intended holding period is. How much you paid for it. Why you own gold in the first place. If you have a long term holding period in mind, and maybe have been holding gold for a while, you are possibly not too concerned about the recent price moves. Indeed, if you are holding gold you bought some years ago, you are still in the green. If you bought at the peak in 2011, not so much. Why you are holding gold, and how you hold it, will probably have a distinct impact on your viewpoint. More on that in a bit. So, in 2013, we can see how a rise in the US dollar index (green arrow) was matched by a fall in the value of the gold ETF GLD (red arrow). As those of you who follow the emerging markets will know, some of the underlying currencies have sold off hard recently. The Indian Rupee was a poster child for that sell-off. But as you can see from the chart comparing Rupee-denominated gold to $US-denominated gold, if you had been in India, buying gold with Rupees earlier this year, you probably wouldn’t have been unhappy. 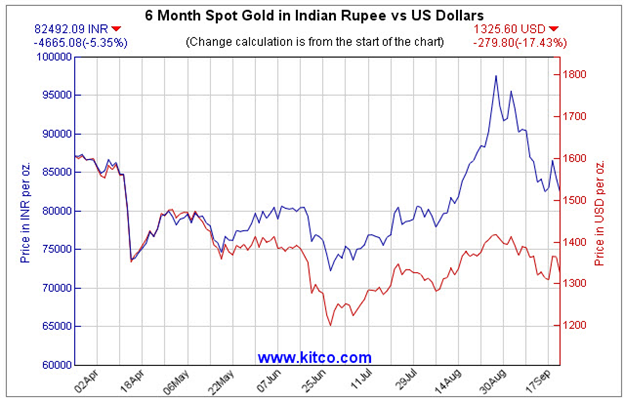 Regardless of the impact of currency devaluation on the purchasing power of your Rupee, gold would have maintained it. And so we circle back to third of the questions we asked at the start of this short article. 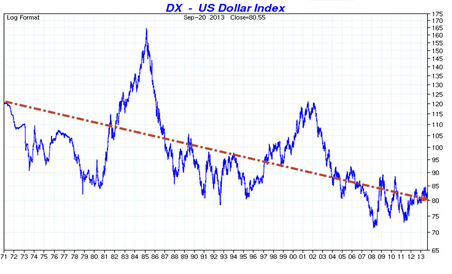 If you buy gold as an investment, well, then, it’s going to be subject to ups and downs. If, however, you buy as a store of value or a hedge against the value of fiat currencies, then you may be more content. In that context, one might consider whether there is any difference between “paper” and physical gold. Setting aside discussions of the doubts some have about how much gold backs “physically backed” ETFS (the ETFs and their auditors say 100%), is there a behavioral difference? I think so. Much of the sell-off in gold this year, was, at least in my opinion, driven by large hedge funds selling GLD positions to take better performing equity positions. Yet, bullion dealers I talk to report fairly brisk business. There is, after all, something comforting about holding real gold in your hand as opposed to looking at a brokerage statement, and perhaps also something to be said for accumulating a position over time using dollar cost averaging.